Beauty | Lentils, Watermelon and Cucumber Skincare? 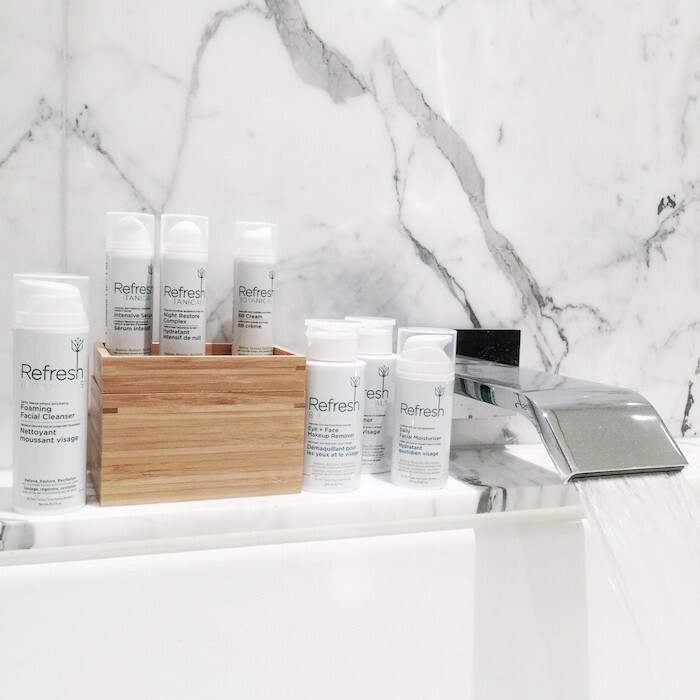 Just a few weeks ago I was invited to go paddle boarding (or sup boarding as the cool kids call it) with a new skincare line, Refresh Botanicals. Since then, I’ve had some time to get acquainted with their Everyday Care and Extra Care lines of skincare products and wanted to share my thoughts about it here. Firstly, I love that the entire line is made right here in Canada AND it’s 90% organic. I have very sensitive skin so when I try new products (which is all the time) I’m always happiest to try those that don’t boast a harsh fragrance or chemicals I can’t pronounce. If you’re one of those people who prefers at-home remedies for your skincare routine – I’m thinking egg yolk face masques whilst whipping up a batch of cupcakes – then Refresh Botanicals might be a great option for you when you forget to do the groceries. The whole point of Refresh Botanicals is to “refresh” your skincare routine. Instead of ingredients you can’t pronounce, Refresh Botanicals is made up of the best botanical extracts and oils from stuff like watermelon, lentils, cucumber, honeysuckle, almond, coconut oil, and figs. I’m no expert but I do know that I feel most healthy when I eat clean and surround myself with essential oils. I feel at one with nature when I meditate with peppermint oil (seriously, try it) and I get that same kind of zest for life when I used the Refresh Botanicals Facial Toner, for example. All that’s left is to do a yoga class and I’m halfway there to Nirvana. Algae Extract: Improves visible signs of aging from: wrinkles, age spots, sun spots & acne scarring. Normalizes the skin’s elasticity naturally from water binding properties. Apple Fruit Extract: Alpha-hydroxyl acids & Vitamin C rejuvenates the skin, and eliminates the appearance of mature acne & scarring. Black Tea Ferment: An advanced antioxidant that helps to defend against damaging free radicals while softening and enhancing lustre of the skin. Fig Fruit Extract: Rich in Vitamin A & Beta-carotene; improves skin’s moisturization & texture. Honey Suckle Flower Extract: Natural anti-inflammatory, anti-bacterial & calming properties. Soothes skin irritations while preventing acne/mature acne breakouts. Lentil Fruit Extract: Reduces access sebum production & acne flare-ups by balancing the skin’s pH balance. Olive Leaf Extract: Rich in Antioxidants & functions as ‘free-radical’ quenching properties while protecting from smoke, ozone & UV rays. Watermelon Fruit Extract: Protects skin from daily environmental stresses. Rich in Vitamin C & Antioxidants. Perfect for skin conditioning & offers a mild, nonabrasive exfoliation. Coconut Oil: Natural fats help retain skin’s moisture. Rich in Vitamin E & protein to rejuvenate skin & improve appearance of scarring, age spots, fine lines & wrinkles. Grape Seed Oil: Absorbs in skin well with high levels of Antioxidants to slow the aging process & aids in collagen restoration & hydration of skin. Jojoba Oil: Highly conditioning &softening, this oil is the closest in mimicking human sebum. Great for sensitive skin& is naturally hypoallergenic. Sweet Almond Oil: Nature’s anti-inflammatory oil that is rich in Vitamins such as B1, B6, B2, A& E. Easily absorbs into skin & aids in prevention of premature aging, scarring, psoriasis, dermatitis, eczema & sunburn. Citric Acid: A preservative and a pH adjuster derived from vegetable oils. Cetyl Alcohol: A fatty alcohol which adds body & viscosity to creams/lotions. Improving texture & feel with its velvety texture. Increases absorption & retention in the epidermis and softens the skin. Sodium Cocoyl Glutamate: A cleansing agent derived from coconut oil. Sodium Lactate: retextures skin’s surface & stimulates cell renewal/cell turnover. An alpha hydroxyl-acid, which prevents the thickening of the skin by inducing exfoliation. Helps control melanin synthesis, hydrates skin and stimulates cell turnover. Sodium PCA: A natural mineral salt that promotes retention of moisture in the skin. Titanium Dioxide: A natural material that functions as a physical sunscreen, protecting the skin from both UVA and UVB rays. *This post was sponsored by Refresh Botanicals however the opinions are my own. I will update on social media over the next 6 months how using Refresh Botanicals has effected my skin’s overall appearance. Stay tuned! Next Post Fake Palms: What Would Jesus Say About Your Decor Decisions?